Financial Accounting: Group statements is a financial accounting textbook covering the topic area 'Group statements' which is an integral part of the syllabus at second and third year. 'Group statements' refers to the consolidated financial statements of a holding or parent company as well as its subsidiaries and provides information on the overall financial standing of the group of companies. The book takes a principles-based approach to financial accounting as it explains the 'why' as well as the 'how to' of preparing group statements. 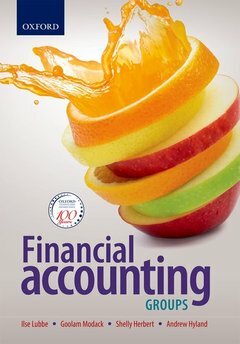 Financial Accounting: Group statements features the following: - Activity boxes that help students to acquire core pervasive skills - Short examples in the text that illustrate practical application of the principles discussed - Graded questions, divided into basic, intermediate and advanced for each chapter The book is beneficial to second- and third-year Financial Accounting students of BCom degrees at universities, and to National Diploma in Accounting students at universities of technology.